There is a lot of interest in making educational games and history games are no exception. This post kicks off an occasional series of co-authored posts by myself and Marjee Chmiel. Marjee has extensive credentials as an educational game designer and educator. She developed an array of educational games for National Geographic, worked on professional development for teachers at PBS, and is currently the school based technology specialist at Thomas Jefferson High School for Science and Technology. In this series we plan to review and comment on free educational history games from a practical perspective in the hopes of helping to surface exactly what it is that makes a game valuable for the classroom. We are starting off with a look at Jamestown Adventure. Since it is a free online game you can go play it quick and comeback and share your thoughts on it in the comments. 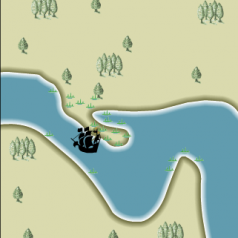 Jamestown Adventure is a relatively simple flash game that we both think is aging quite well. The game exemplifies the value that a “less is more” approach to games, one that eschews grandiose notions of immersive worlds, can have for creating little games that are actually useful and used in today’s classrooms. For the sake of comparison, we contrast Jamestown Adventure with Discover Babylon, in many ways the exact opposite of Jamestown Adventure. Jamestown Adventure falls just slightly on the side of actually being a game, being somewhat of a digital Choose-your-own-Adventure. 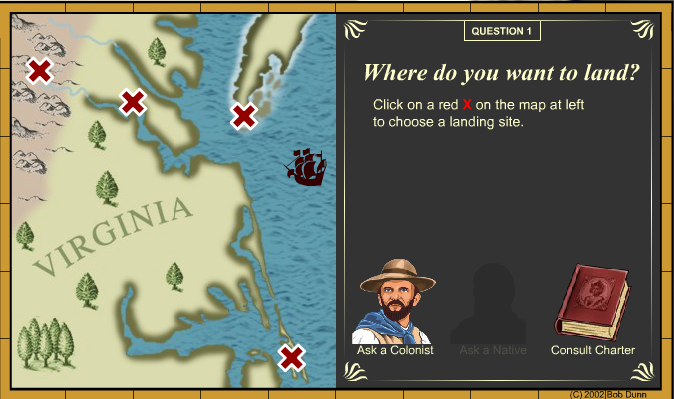 In this small Flash game you get to make a series of decisions, posed as questions, about colonizing Jamestown. For example, in the image below you are deciding where to build your colony. From there you are presented with a series of further choices with explanatory animations. At each step, you have the opportunity to ask a colonist, talk to a native, or consult the primary source, (the text of the town charter). At the end of the game you get a quick report that you can print out and share and compare with others. The report gives you a sense of what actually happened and provides a comparison of your decisions with those of the actual colonists. You end up finding out if you did better or worse than the Colonists. The whole game takes about ten to twenty minutes to play, perfect amount of class time and given the amount of time teachers actually have to cover these topics, the time it takes to play the game is mindful of the realities and of the classroom. 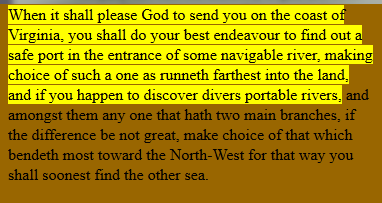 Primary Source as Asset: You do better at the game if you click to consult the charter, which shows highlighted relevant parts of the document to you. Differing Historical Actors Perspectives: The straightforward ability to consult different individuals who represent different historical perspectives gets you to think about different perspectives and evaluate those perspectives in making decisions in the game. Potential for Transgressive Play: You are free to try and make the worst possible decisions. Heck the game encourages you to. See what happens when you decide to not plant any crops and build a stone fortress. Mild replay value: You play through, you see the result, you want to go back and see if you can do it even better. Each play through gives you a chance to think through different scenarios and compare them to the actual past. It is a great opportunity to exercise counterfactual thinking. Look over each others shoulders value: It is great to use this game as a classroom activity, if you have computers for every student you can set them all up and, because there are different threads in this choose your own adventure. Print outs are a godsend for the classroom: At the end of using this particular game in a classroom the game sets a teacher up with a great activity. Print these out, break into groups and talk through comparing each others print outs. Discover Babylon is indicative of a lot of different games projects out there. It is a cool idea, and to be clear, it’s original context is for a museum. However, it was created to “set the bar” in terms of what is possible for history learning games, therefore it is worth bringing it up primarily as a point of contrast to some of what makes Jamestown Adventure a useful game for the classroom. The game opens with a cataclysmic event—an earthquake in Baltimore. The player quickly learns that this event is caused by an ingenious archaeologist named Dexter who has figured out how to travel back in time, accidentally and unknowingly wreaking havoc with the fabric of time. The storyline then unfolds, compelling the player to go on a series of missions to ancient Iraq to find Dex and restore the fabric of time The player travels back in time, ‘leaping’ into the body of several historically attested characters. 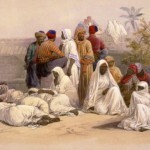 In the first level, the player assumes the character of Taribi, a 12 year old boy studying to be a scribe. Living a day in Taribi’s life, the player is challenged to learn what he would have learned in school. Players are encouraged to learn by discovery and to experience one of the earliest cities, Uruk ca. 3100 BC. Cool story! Sounds like some serious exposition there. This is a big problem for bringing a game into the classroom. Classroom sessions are short, and teachers do not have a lot of time for something that doesn’t check off several standards at the same time. Beyond this, Discover Babylon is a 200mb download that runs on Windows machines. This is itself a non-starter for many teachers who 1) often do not have the ability to install software on the machines and 2) if they can, would then need to pre-install, say 20 copies of this game on computers in a computer lab. This brings us to the final major problem. While the Ancient Babylon may be interesting it isn’t really a good fit for the structure of the American curriculum. This is to say that the game doesn’t really have a place in terms of meshing with what a teacher needs to cover. With all this said, it is important to note that Discover Babylon’s original audience, museum visitors, are not affected by these requirements. In any event, it is critical to note that if one wants to make an argument for the idea that a game can serve classroom purposes it can’t be an afterthought. If anyone wants to make a game for classroom teachers to use, and actually wants to make it something that they will in fact use it shouldn’t be your epic story about something you care passionately about. Things that are useful and used look more like Jamestown Adventure than Discover Babylon. You can play them in browsers and you can play them in 20 minutes. As we have suggested, there is a lot of interesting historical thinking going on in Jamestown Adventure. You want to have the mechanics of the actual game directly support learning objectives and ideally you want there to be a discrete take away object, like the printout, that the teacher can use as a means to structure classroom activity. In short, games that are made for the classroom should look like they were made for the classroom. They should fit the design and constraints of the classroom. Again, this isn’t about bashing Discover Babylon, which sounds like a hoot to play around with at home, that game serves as a foil to highlight how features of a seemingly simple and straightforward game, Jamestown Adventure, is actually jam packed with features that very insightful create a useful learning tool customized for use as a classroom activity. Good points on why Jamestown Adventure is a good game for teachers to still include in the classroom! If you (as an educational game maker) make things beneficial and easy for teachers, then you have easier access to your perceived audience. In my first playthrough I made gentlemen work in addition to indentured servants, and my final outcome was all right. In the second play through I made some decisions I thought were not good (making a fort instead of a town, not making gentlemen work) and my colonists promoted me! Funny how the metrics for success are based around the colonists’ worldview in addition to the more basic needs for food and protection. My own personal metrics for success (respecting the Powhatan, getting lots of food, building an egalitarian community) did not get me promoted. This game, through its “choose your own adventure” mechanics and follow-up certificate, reminded me that my own preoccupations wouldn’t have made me popular among colonists, haha! Not everyday that a game makes you think like that…so in addition to being an easy game for teachers to use, I think the game itself is thought-provoking, too! Now, I’d love to try out Discover Babylon, but in addition to their other technological mistakes, they have not published the game for Mac or Linux operating systems. I’m not the only one who noticed and pointed out that this decision actually works against their mission to educate others. “Sadly, by choosing Microsoft’s OS for game, you left out significant portion of world poorer population… I’m refurbishing PCs with Linux OS for lower income families in Greenville, SC, USA but unable to introduce them to these educational games… It might be working in WINE, but native support is preferable. Any plans to include other OS versions of the games, especially on Linux platform? Open source community developers surely would be glad to help! Happy to follow this new series, Trevor and Marjee. Keep ’em coming!